Offering organization and easy access to frequently used supplies. Features a carry handle and sturdy latch. Inside is a lift-out tray with four fixed compartments and convenient carry handle. 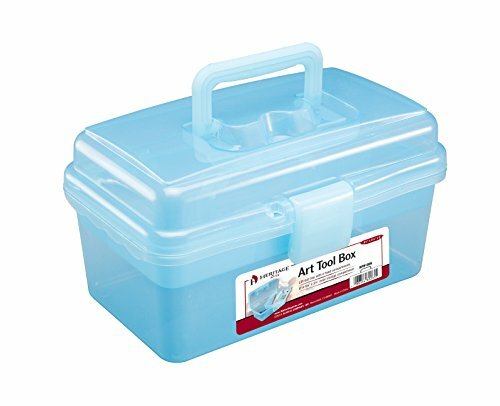 Measuring 9 inches x 4 1/2 inches, the main storage compartment can accommodate brushes, pencils, paints, and much more. Translucent blue. Overall measurements: 9 1/2 inches x 5 1/4 inches x 5 inches. Manufacturer: Alvin & Company, Inc. Publisher: Alvin & Company, Inc. Studio: Alvin & Company, Inc. If you have any questions about this product by Heritage Arts, contact us by completing and submitting the form below. If you are looking for a specif part number, please include it with your message.